This letter was written by Reverend Robert Lilly to Lewis Allen Alderson. Lilly was a long-time pastor at Lyles Baptist Church in Fluvanna County, Virginia. 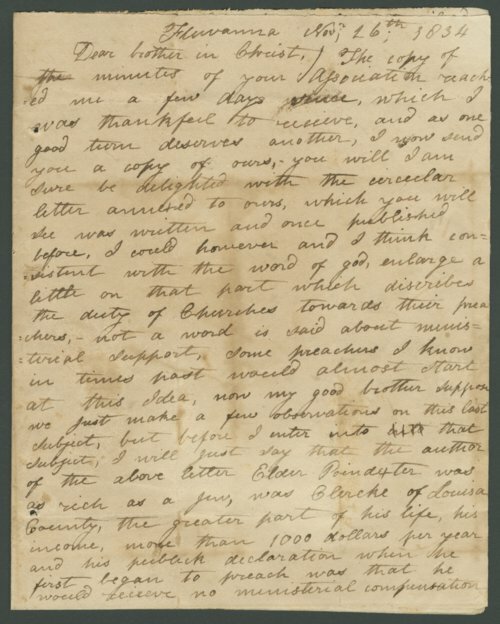 The letter focuses on the topic of ministerial support, which in Lilly's opinion, forces preachers to either live in poverty or accept money from the church by "selling the gospel". The letter specifically mentions George Poindexter who was wealthy and able to preach without compensation. Alderson later moved to Atchison, Kansas, in 1858 and was a prominent Baptist minister. He died in Atchison in 1881.